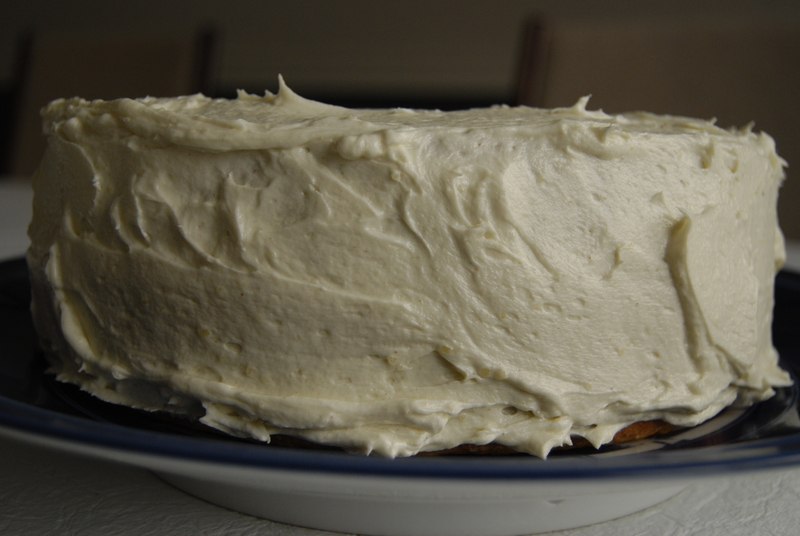 This entry was posted on January 2, 2012 at 4:37 pm and is filed under Cake, Christmas, dessert, Uncategorized. You can follow any responses to this entry through the RSS 2.0 feed. You can leave a response, or trackback from your own site. I’m an eggnog lover. I try to limit my intake though since I think it’s probably the worst drink in the world for you (but so good :)). I have yet to bake with eggnog (other than putting some in my bread pudding this year), and unless I make my own, probably won’t have a chance to until next Christmas. But the cake looks fantastic and in my opinion it’s always better to make half batch cakes ’cause then you can justify making two kinds :). Thanks for stopping by and leaving a comment. 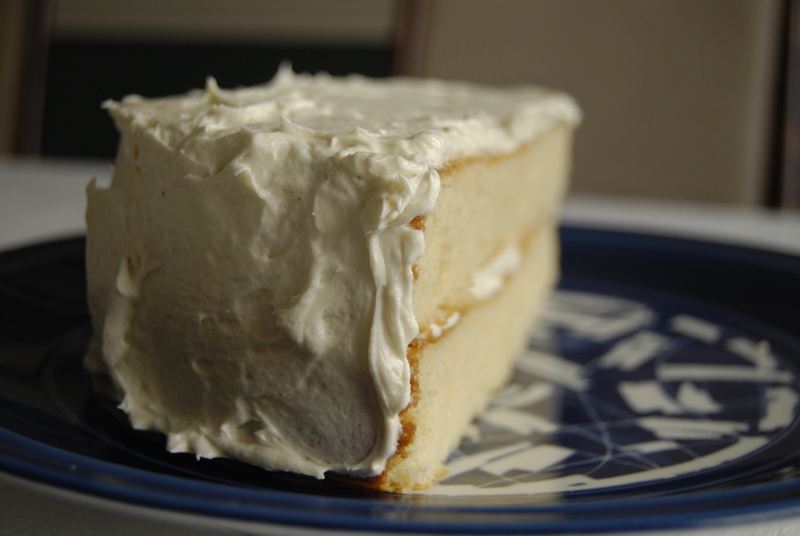 If you like eggnog I’m thinking you might really like this cake. It’s very tasty and has a nice texture which is actually improved on day 2. I too love egg nog and buy the lower fat version. This cake and frosting look delicious! How did you cut the cake? I’ve never split one layer in half. I’m a bit intimidated to try! Yours looks even better than mine! BTW, the first picture file seems to be broken. The ones at the bottom worked, but the first one had an X.
Anna. Thanks for pointing out the photo problem. I think it’s fixed now. I don’t think mine looks better than yours, but thank you for the compliment. Thanks for the recipe!! Gloria. I didn’t split the cake. 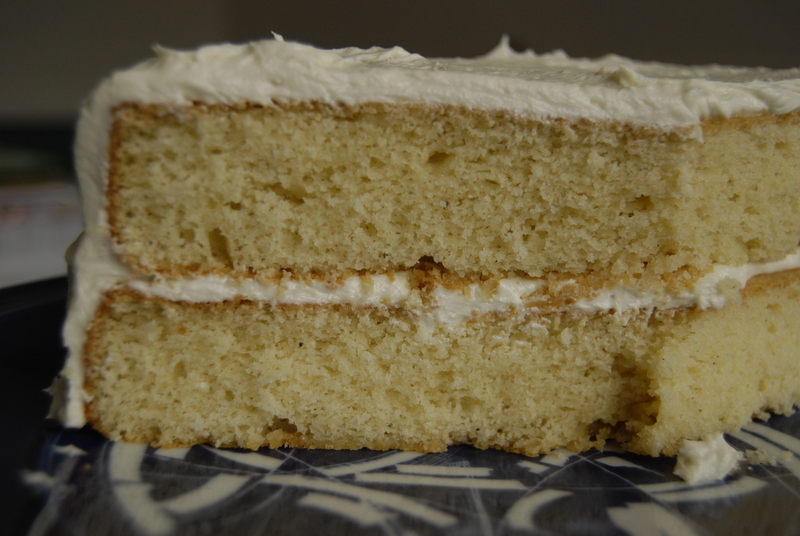 It is one layer baked and the one layer is cut in half and then stacked on top of itself. Itt looks like a two layer cake, but it’s really just one layer cut into two. I feel like I’m babbling now. Oh wow! Too bad for me that I can’t go!!! If you go shoot me an email and tell me all about it! I didn’t go. I was sweeted out! I think he said Tuesdays are macaron days…so there will be another chance!